The next Planning Commission meeting is being held on June 21, at 7:00 p.m. If you are interested in a specific topic, please visit the Boards and Committees page for more information. 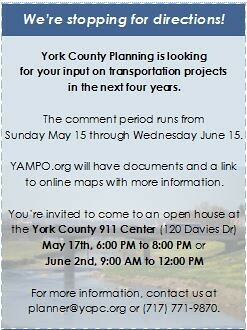 The next YAMPO meeting is being held on June 2, at 9:00 am. Please visit the Boards and Committees page for more information. The York County Heritage Program is currently accepting applications! From the Maple Shade Barn to the Stewartstown Railroad, and from the Hanover Farmers Market to Shank's Mare, Heritage abounds in York County. Heritage Program application and information is available on the YCPC website at http://www.ycpc.org/land-use/heritage-preservation.html#heritage Deadline to submit applications is June 7, 2016! The South Central Assembly and the York Housing Advisory Commission are pleased to invite you to our Regional Housing Summit, "Housing: Yours, Mine, Ours". This Summit provides a forum to share Best Practices and discuss key housing problems and issues facing communities, citizens and housing agencies in Adams, Cumberland, Dauphin, Franklin, Lancaster, Lebanon, Perry, and York Counties. Officials and professionals from state, local and county government, nonprofit and for profit housing organizations, banks, colleges, consulting firms, and interested citizens have been invited to the Summit, providing a chance for input from all sectors of South Central Pennsylvania. The Summit features sessions in six tracks that offer a broad range of topics for groups that serve our communities. The tracks include: County & Municipal Issues, Helping The Homeless, Affordable Housing Issues, Affordable Housing Resources, Housing and Older Adults, and Healthy Housing. Two plenary sessions highlight Affordable & Workforce Housing Challenges & Opportunities and State & Federal Housing Directions. The Summit has been planned by volunteers from the South Central Assembly and the York Housing Advisory Commission. This biennial event is made possible by the generous support of the sponsors and exhibitors listed in this program. We have built the Summit with you in mind, offering many sessions, a chance to hear your needs, and providing information on new resources and best practices to help you solve your community's problems. We have kept registration fees low and the value high to encourage attendance from all corners of the region. Please see the attached LTAP Training Needs Survey (click here). If you are interested in taking any classes or hosting a class or classes, please fill the survey out and return it to Barb Forry at bforry@ycpc.org no later than June 3, 2016. Please click on the following link for course descriptions.